The treatises in this manuscript were translated from Greek into Latin by Antonio Beccaria of Verona, who was secretary to Humfrey, Duke of Gloucester (1390-1447), from 1439. 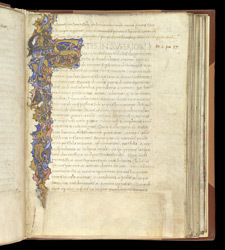 Humfrey was the younger brother of King Henry V, and regent of England after the latter's death in 1422, and this manuscript has his ownership inscriptions. Although the script is apparently by a scribe trained in Italy, it was probably written in England, and the decoration is a hybrid of English and Italian styles. By 1444 he had given it to Oxford University. This initial 'S' and the associated border teem with hybrid creatures. The border perhaps originally extended into the lower margin and included a heraldic shield or other mark of ownership, excised by some later owner. The heading in the upper margin names Beccaria as the translator.